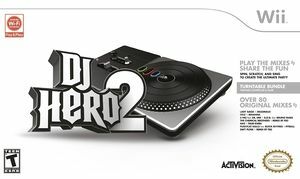 DJ Hero 2 is a rhythm video game and a sequel to DJ Hero, a spinoff of the Guitar Hero series. DJ Hero 2 uses a special turntable-controller, the same as introduced in DJ Hero, to simulate turntablism, the act of creating a new musical work from one or more previously-recorded songs using record players and sound effect generators. The game is developed by FreeStyleGames and is published by Activision, and was released worldwide in October 2010. Similar to DJ Hero, players in DJ Hero 2 follow specific actions on the turntable controller in time to marked scrolling indicators on the game's screen, earning points for correctly performing actions in time. The game includes a new freestyle mode, giving the player the chance to freely crossfade between tracks, scratch a section of a mix, or add sample effects during marked sections. The game features 83 mixes on disc comprising over 100 different songs, with further mixes available as downloadable content. Most mixes have been assembled by FreeStyleGames, but other professional DJs, including David Guetta, deadmau5, DJ Qbert, Tiësto and RZA, have provided both their mixing skills and character avatar for the game. Players can challenge these mixes at any time in a Quickplay mode, progress through them in the single-player Empire mode, or play cooperatively or competitively with a second user in offline and online game modes. A third player can also participate through singing the mix' vocals. The DJ Hero series uses a turntable peripheral. Using a real Wii Remote and real turntable works without any special configuration. Dolphin does have a emulated turntable peripheral within the emulated Wii Remote configuration menu. It must be selected and configured for the game to be playable. The graph below charts the compatibility with DJ Hero 2 since Dolphin's 2.0 release, listing revisions only where a compatibility change occurred.